Cool temps are a good thing this time of year, although we long for warmth. 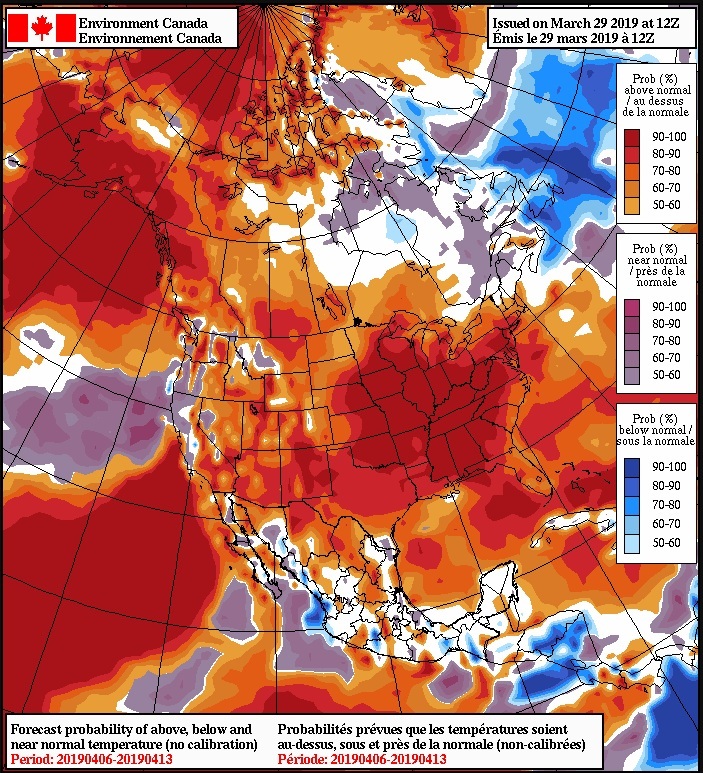 NAEFS is hinting at some REAL warmth the second week of April…something to dream about. I would love a week of 70F or better to get everything moving. Very warm look… .who knows…maybe 80F? Doesn’t take much this time of year. Tomorrow will be the 3rd day into the 70s with no rain here. The air smells like spring flowers. Bumblebees are noticeable everywhere while I graft. My dog took a snooze right out in the open yard in the sunshine. It’s kind of wonderful! NAEFS is hinting at some REAL warmth the second week of April…something to dream about. I would love a week of 70F or better to get everything moving. I would love that too…but I imagine my trees would prefer a continued slowly warming spring. If that long range forecast is accurate, I may be able to get a dormant oil/copper spray done in 10 days or so. If it weren’t for the low 20s forecast for tonite, I could have planted out the vegetable garden on Wednesday. Ground was all ready. Why didn’t you plant the seeds? (and broccoli and cabbages and onion sets or plants),…they could probably take it? And April 3rd it may be safe to plant even tomatoes and beans…here in my area…if you keep something handy to cover them just in case. All day yesterday ranged from 58 to 63…and last night too. Partly sunny, windy, and heading towards 70 if it ain’t already there! (Imagine it’s supposed to be mid-20’s tomorrow night). Soil temperature. I’ve discovered that later-planted peas in warmer soil will sprout before seeds planted in cold soil earlier. Last week the temps were just about right, but this cold snap, altho brief, will likely freeze the soil. I did plant the onions, plus a row of lettuce seedlings and some early cabbage, but an early frost might set back broccoli heading. I’ve discovered that later-planted peas in warmer soil will sprout before seeds planted in cold soil earlier. Winds are annoyingly strong today. Would be a nice day if not for the hurricane breeze. Nothing planted here. I think i still have frost in my garden bed. I was just thinking… Home Depot had a bunch of trees out the other day. I really hope they plan on moving them inside tonite. Got about a three hour storm here, don’t have a rain gauge, but guessing we got close to an inch based on how hard it was coming down. Got to upper 70s today, now low 40s, with mid 20s for Sunday night. Rainy days seem to getting further apart, ground is really starting to firm up, might have to plow in a few weeks. I saw 22 on Accuweather for tonight. Brrrr……I’ll bring inside some lilac, honeyberry, and redfleshed apples that have leaves nearly full sized. My bench grafts will just have to shiver and take it. I hear you. I don’t have nectarines, even peaches seldom get past the frosts with a crop. 28 with a windchill around 15 right now. My electric sprayer is stored in an unheated garage with a dab of antifreeze in it. I was really kicking myself for not getting it out and doing my dormant oil spray on that last warm day three days ago, but, this morning, I’m kinda glad I didn’t because it went down to 23°F last night. I feel sorry for you guys in other parts of the country. How do you plant with 70° today 20° overnight??? Holy! My electric sprayer is stored in an unheated garage with a dab of antifreeze in it. Lots of sun lately which is nice. No real significant precip until Thurs. Warmer the next few days.